Original name ALESSANDRO DI MARIANO FILIPEPI (b. 1445, Florence [Italy]--d. May 17, 1510, Florence), Florentine early Renaissance painter whose Birth of Venus (c. 1485) and Primavera (1477-78) are often said to epitomize for modern viewers the spirit of the Renaissance. His ecclesiastical commissions included work for all the major churches of Florence and for the Sistine Chapel in Rome. His name is derived from his elder brother Giovanni, a pawnbroker, who was called Il Botticello ("The Little Barrel"). Although he was one of the most individual painters of the Italian Renaissance, Sandro Botticelli remained little known for centuries after his death. Then his work was rediscovered late in the 19th century by a group of artists in England known as the Pre-Raphaelites. 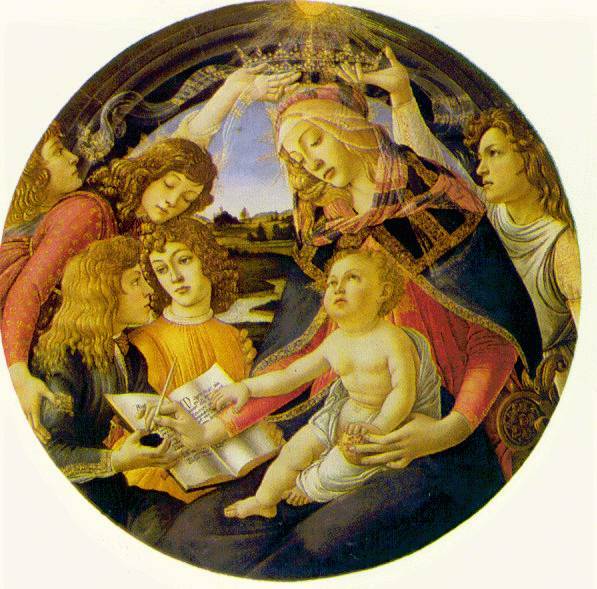 Born Alessandro di Mariano Filipepi in Florence in 1445, Botticelli was apprenticed to a goldsmith. Later he was a pupil of the painter Fra Filippo Lippi. He spent all his life in Florence except for a visit to Rome in 1481-82. There he painted wall frescoes in the Sistine Chapel of the Vatican. 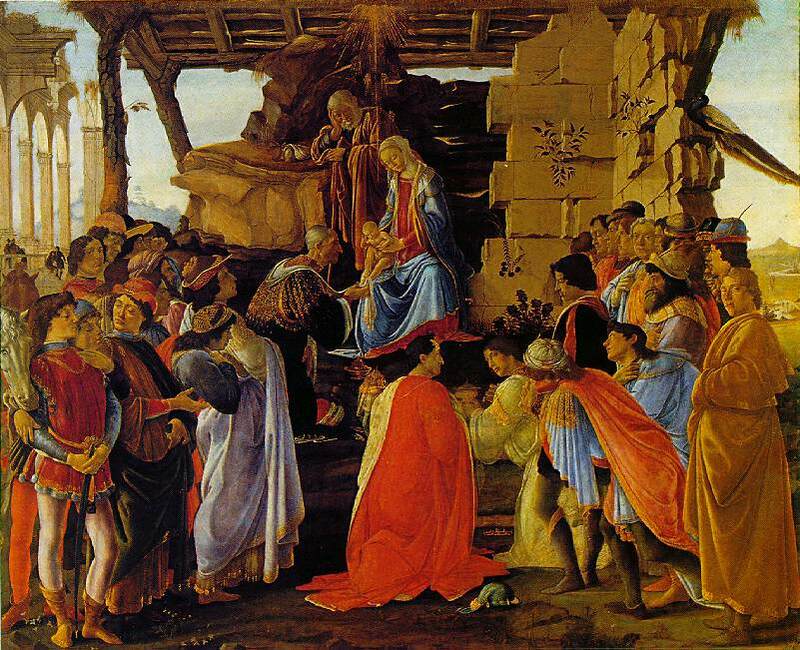 In Florence, Botticelli was a protege of several members of the powerful Medici family. He painted portraits of the family and many religious pictures, including the famous The Adoration of the Magi . The most original of his paintings are those illustrating Greek and Roman legends. The best known are the two large panels Primavera and The Birth of Venus . Contributors: Mark Harden and Carol Gerten-Jackson. 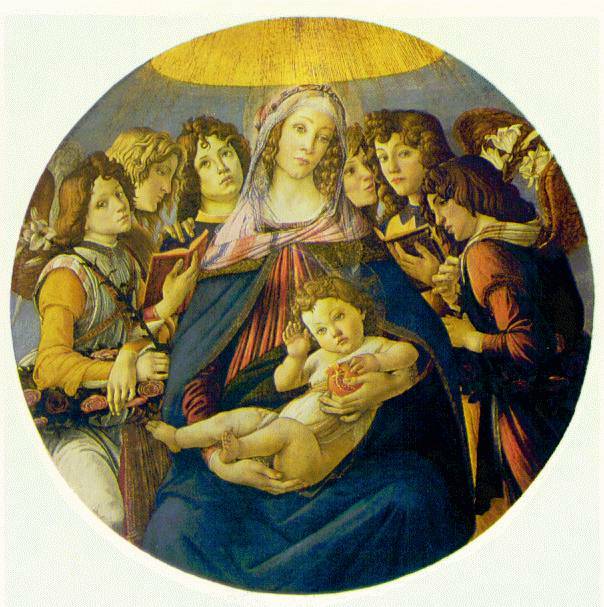 After Masaccio, Sandro Botticelli (Alessandro di Moriano Filipepi, 1444/5-1510) comes as the next great painter of the Florentine tradition. The new, sharply contoured, slender form and rippling sinuous line that is synonymous with Botticelli was influenced by the brilliant, precise draftsmanship of the Pollaiuolo brothers, who trained not only as painters, but as goldsmiths, engravers, sculptors, and embroidery designers. However, the rather stiff, scientifically formulaic appearance of the Pollaiuolos' painting of The Martyrdom of St Sebastian , for instance, which clearly follows anatomical dictates, finds no place in the painting of Botticelli. His sophisticated understanding of perspective, anatomy, and the Humanist debate of the Medici court never overshadows the sheer poetry of his vision. Nothing is more gracious, in lyrical beauty, than Botticelli's mythological paintings Primavera and The Birth of Venus , where the pagan story is taken with reverent seriousness and Venus is the Virgin Mary in another form. But it is also significant that no-one has ever agreed on the actual subject of Primavera , and a whole shelf in a library can be taken up with different theories; but though scholars may argue, we need no theories to make Primavera dear to us. In this allegory of life, beauty, and knowledge united by love, Botticelli catches the freshness of an early spring morning, with the pale light shining through the tall, straight trees, already laden with their golden fruit: oranges, or the mythical Golden Apples of the Hesperides? At the right Zephyr, the warm wind of Spring, embraces the Roman goddess Flora, or perhaps the earth nymph Chloris, disphanously clad and running from his amorous clasp. She is shown at the moment of her metamorphosis into Flora, as her breath turns to flowers which take root over the countryside. Across from her, we see Flora as a goddess, in all her glory (or perhaps her daughter Persephone, who spends half her time beneath the earth, as befits the patron saint of flowers) as she steps forward clad in blossoms. In the centre is a gentle Venus, all dignity and promise of spiritual joy, and above her, the infant Cupid aims his loving arrows. To the left, the Three Graces dance in a silent reverie of grace, removed from the others in time also, as indicated by the breeze that wafts their hair and clothes in the opposite direction from Zephyr's gusts. Mercury, the messenger of the gods, provides another male counterpart to the Zephyr. Zephyr initiates, breathing love into the warmth he brings to a wintry world, and Mercury sublimates, taking the hopes of humanity and opening the way to the gods. Everything in this miraculous work is profoundly life-enhancing. Yet it offers no safeguards against pain or accident: Cupid is blindfolded as he flies, and the graces seem enclosed in their own private bliss. So the poetry has an underlying wistfulness, a sort of musing nostalgia for something that we cannot possess, yet something with which we feel so deeply in tune. Even the gentle yet strong colors speak of this ambivalence: the figures have an unmistakable presence and weight as they stand before us, moving in the slowest of rhythms. Yet they also seem insubstantial, a dream of what might be rather than a sight of what is. This longing, this hauntingly intangible sadness is even more visible in the lovely face of Venus as she is wafted to our dark shores by the winds, and the garment, rich though it is, waits ready to cover up her sweet and naked body. We cannot look upon love unclothed, says The Birth of Venus ; we are too weak, maybe too polluted, to bear the beauty. 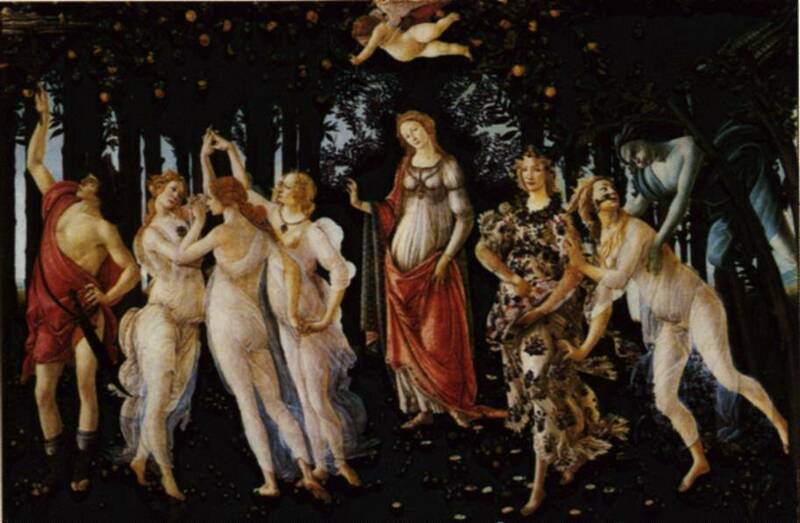 Botticelli accepted that paganism, too, was a religion and could bear profoundly philosophical significance. His religious paintings manifest this belief by converging all truths into one. He seems to have had a personal devotion to the biblical account of The Adoration of the Magi , setting it in a ruined classical world. This was not uncommon Renaissance device, suggesting that the birth of Christ brought fulfilment to the hopes of everyone, completing the achievements of the past. 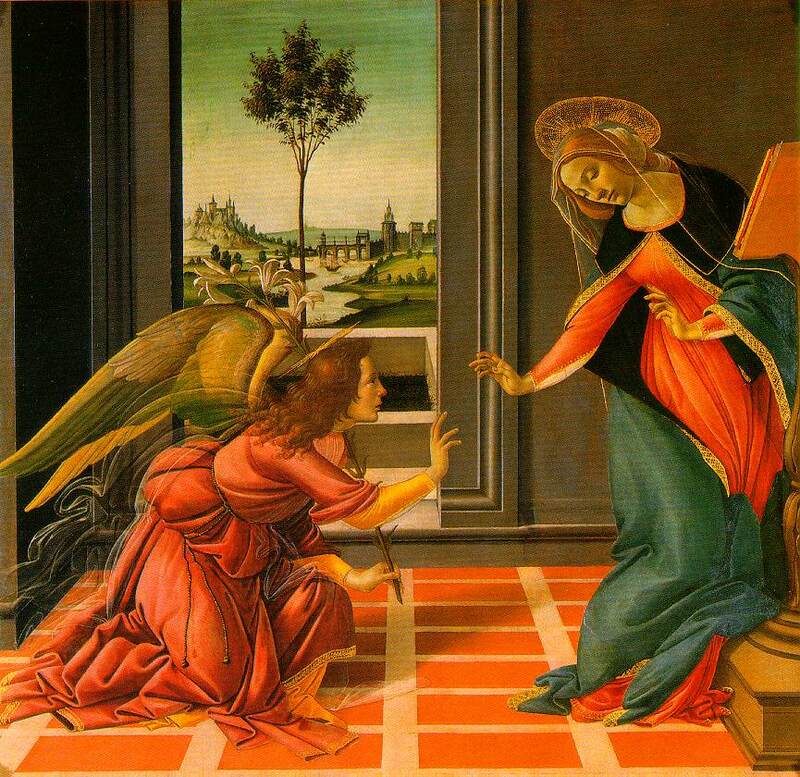 But no painter felt this with the intensity of Botticelli. We feel that he desperately needed this psychic reassurance, and that the wild graphic power of his Adoration 's great circles of activity, coming to rest on the still center of the Virgin and her Child, made visible his own interior circlings. Even the far green hills sway in sympathy with the clustered humans as if by magnetic attraction around the incarnate Lord. Botticelli was not the only Florentine to be blessed or afflicted by an intensely anxious temperament. In the 1490s, the city of Florence was overtaken by a political crisis. The Medici government fell, and there followed a four-year period of extremist religious rule under the zealot Savonarola. Either in response to this, or possibly out of some desire of his own for stylistic experimentation, Botticelli produced a series of rather clumsy-looking religious works--the San Bernabo Altarpiece is an example.